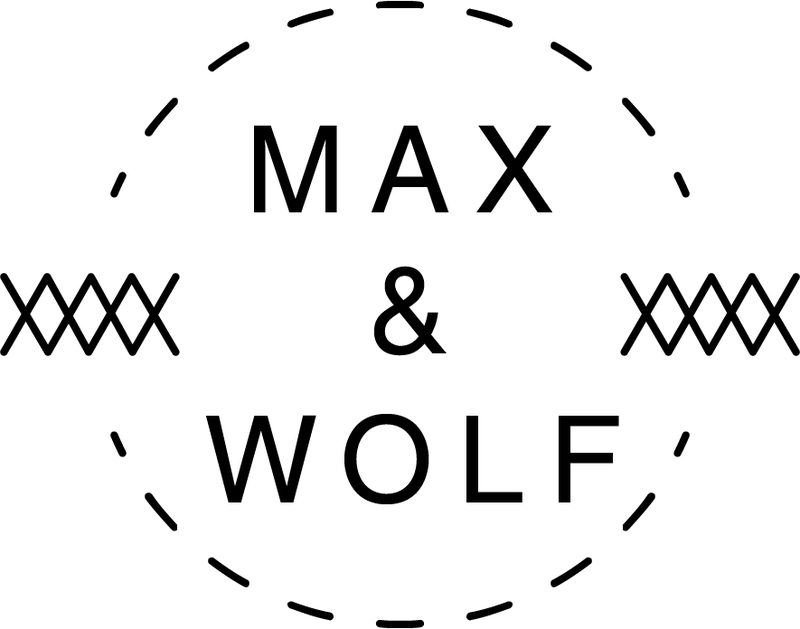 Max & Wolf – Graphic designer by day, sewist by night. Graphic designer by day, sewist by night. March was a busy month, but not so much as a maker. With a trip out West to see family and friends, and the Daughter’s two (two!) plays, I had less time to sew, quilt and knit that I would have liked. I made no progress on my 2019 Make Nine. But, the things I did make were satisfying nonetheless. One of the chairs in my workroom is a black folding chair and that metal can get pretty cold, and uncomfortably unforgivingly hard, especially in the winter. Using solid pre-cut strips and fat quarters from my stash, I made a chair cushion with ties to give it a much needed boost of comfort. I used concentric echoed stitching on the larger swathes of fabric and kinda just did a partial echo on the stripes. Even though I’m sitting on it and not lounging on it, the texture of the quilting still makes me happy! My aunt asked me to make her a small wallet, so I was happy to do so. I got to pull out some fabric from my stash that doesn’t quite suit me but is perfect for her. And luckily I had some basic gray solid fabric and a nylon zipper to match. This is pretty much a coin purse, but sized to hold a credit card and bills when folded in half. I’d like to develop my skills at crocheting and knitting with needles, but I’ve stalled out and my progress is nil. In the meantime, I still enjoy using the circle looms to knit. I finally found some yarn that is chunky enough for my skill level that also has a subtle natural texture and color to match my design aesthetic. And the result is a knit hat in gray and gray. Certainly keeps me warm in this third reprise of winter that we’re having. (I know I shouldn’t be, but every March I’m surprised at how long winter seems to stick around). Here’s hoping my next blog post brings some progress to my Make Nine and warmer weather. Make Nine and Then Some! Two months of focused, Make Nine Challenge projects has been great and I’ve peppered February with a few extra makes to keep things interesting. I finally finished the Kodiak Crossover, but with some changes. The zipper and fabric combination I chose seemed to conflict with each other causing the two to become very wavy and distracting. I ended up removing the zipper and turning the piece into a pullover. I love the idea of the original pattern, but I found it very difficult to test fit along the way leaving me with an ill-fitting project that I had to alter in the end. Of course, now that I’ve made it once, I can use those fit issue challenges as lessons learned to make adjustments the next time I make it. I also tackled my own backpack/cross-body bag redo choosing to simplify the design. It still has the convertible strap to switch between backpack and cross-body, zipper closure and two interior pockets. But I integrated an outside handle in the strap guides to be able to hang the bag on a hook or hold onto it while converting it. I’ve used up some upholstery samples I’ve been saving for a while and included two grommets (a new skill I learned making the Kodiak) as a visual effect that reveal the blue fabric through the green. Since loom knitting is now part of my crafting hobby, I made a pair of fingerless mittens for my grandmother’s caregiver. She liked the pair I made for my grandmother so much I decided to gift one to her too! Light blue with a variegated blue yarn for the cuffs make these pretty and bright. I used the pattern from Tuteate and just skipped a few rows in the main body to shorten it a bit. A fairly quick project was a basic t-shirt using the free (free!) Sage pattern from Elbe textiles. I used some remnant fabric I scored during an unplanned shopping trip to Vogue. The color palette definitely reminds of something vintage from the 70s I probably had in my closet as a kid. That Sage T worked out so well, it inspired me to Frankenstein my own creation into being. I merged the body of the Sage T, the collar of the Kodiak and self-drafted long sleeves based on a store bought sweater to make this doozy of a pullover! With the addition of color blocking on the front, I’m so excited to get some wear out of it. Alright…lets keep the Make Nine projects moving along! At this rate, I’ll be ready for Me Made May…in 2020. What’s making its way through your sewing room? @thatwendyward Winnats tank dress for the daughter. Neck warmer, like this one from Patigonia, but that fastens so I don’t have to pull it over my head. Multicolored blocks twin size quilt taken from this doodle in my sketchbook. So far, I’ve made good progress on #3, the Kodiak Crossover. I know it only looks like a big pile of scraps, but I’d say I’m 85% done. And I’m learning a bunch of new skills: grommet, snap, zipper and welt pockets. Even if I never finished, I’d have a bunch of new tricks up my sleeve. But I will finish. Yes. I. Will. I probably would have made more progress if I hadn’t gotten distracted by a new (to me) craft. I’ve wanted to knit for a while, but each time I try I get frustrated by it. My daughter had a plastic circle loom tucked in a corner of her closet and I decided to try my hand at this version of knitting. I used some acrylic yarn that felt a little sweaty while I was using it, but I was surprised at how consistent the result was. Maybe this was a stepping stone into the craft of knitting? Well, I hunted around Ravelry for a bit to see what the experts said and it turns out that loom knitting is a whole subset of the knitting world. (I thought maybe it wasn’t considered real knitting, but someone posed the question, “Is sewing with a machine not real sewing?” So, there’s my answer.) I now have a new fiber craft and a new very warm and welcoming online community to chum around with. You can find me on Ravelry as @maxandwolf. I’m currently making (very slow) progress on a scarf in grass green yarn and I think I might even make it into #7 from my Make Nine. I just have to figure out how to add a closer to yarn. Just before I tackled the green scarf, I completed two other knitted pieces. The first a pair of fingerless mittens for my grandmother. Even though she lives in sunny So Cal, the mornings can be a bit chilly and these mittens are keeping her hands warm. The second project was a winter hat for me with the brim in the same yarn as the mittens. It keeps my head warm and gives me a nice daily connection to a woman I love with all my heart. Finally, I love using pre-cut cotton quilting fabric strips as a sort of pallet cleanser for me. It’s just the best parts of sewing: playing with color combinations, the easy hum of the machine, a relatively fast project to complete and a zippy colorful result. This month I added two more lumbar pillows to my growing collection. One in spring greens and yellows, the other in watery blues with the added joy of a couple of pieces of navy blue flannel and hand embroidery for the quilting. Oh yeah, and Helen and Caroline from Love to Sew podcast included me in their who to follow men who sew Instagram story…I’m blown away to be included in such fine company and to be recognized my my sewing heroes! Well, that’s my January of fiber crafts…how’s yours? See you next month, hopefully with a finished Kodiak! After completing the simple introductory project of Simplicity’s Casual Pants, I was eager to make something a little more challenging. I also wanted to make something I would wear on a regular basis. The Finlayson sweater is what I settled on—I figured that once I had the mechanics of it down, it would probably become a tried-and-true garment. 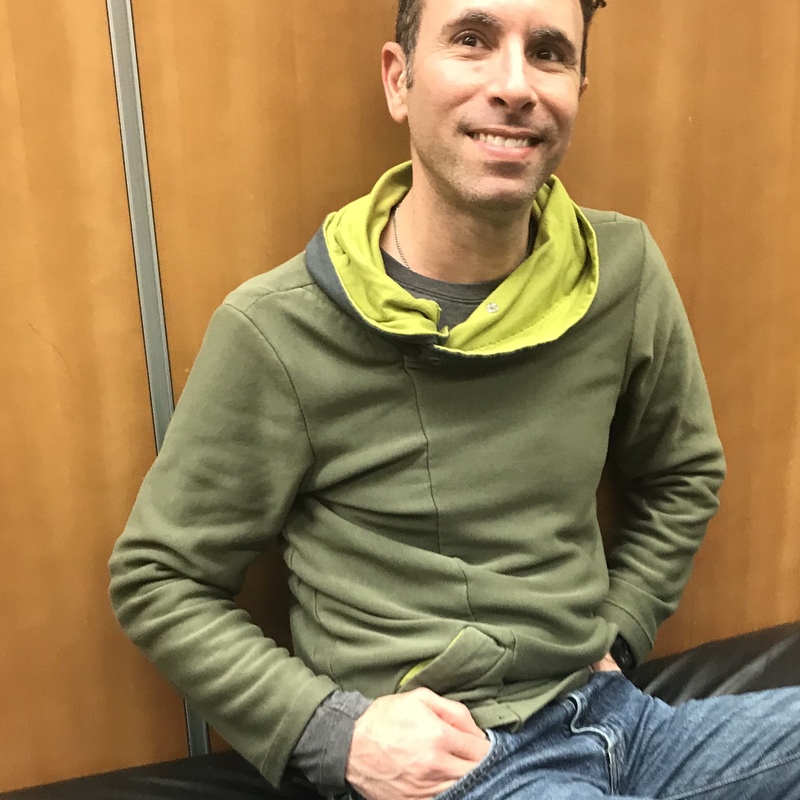 The collar elevates it from the humble sweatshirt, and depending on the fabric used, it can either be weekend lounge wear (think polar fleece) or business casual work appropriate (how about merino wool?). So, days 4, 5 and 6 of the sewing class I was taking became Finlayson time. I chose a charcoal sweatshirt cotton blend and added a woven cotton with a fun plus pattern for the neckline facing (gives it a little secret sass). Because I was making it in sweatshirt fabric, which is already pretty casual, I opted to skip the pockets to make it a little more refined so I could wear it work. A couple of techniques I tried out for the first time with this make: I traced the pattern in my size onto Swedish tracing paper to keep the original intact. I’m glad I did because the weight of the tracing paper is a little easier for me to work with than pattern tissue. I also used Dritz Washaway Wonder Tape to keep the cuffs and waist hem secure while I sewed them and that really helped keep the fabric from stretching out. Finally, I added a teflon foot to my sewing machine to keep the fabric moving along. I can’t say enough how please I am with how it turned out. I see a lot more variations on this sweater in my closet in the near future! About a month ago, I took my sewing machine in for tuneup. While filling out the paperwork, the employee and I started talking about the sewing classes they offered. The class was called “Start and Keep Sewing” and it was structured for beginner and intermediate sewists to learn how to sew or get guidance on a technique that might be difficult. I’ve been wanting to take a garment sewing class for a while and just hadn’t found the right one, but this one seemed to fit the bill. Day one I was ready to go: I had all my supplies, fabric pre-washed and pressed, machine in tow–I was eager to put thread to fabric! But as the teacher welcomed us to the class she said we wouldn’t be sewing today—there’s much to learn before we begin. From grain line, to weave versus knit, how to read the pattern envelope to the markings on the tissue itself. I think the most eye-opening point that I learned was how the size of clothing has almost nothing to do with your body’s measurements. For instance, I was making Simplicity pattern 8022 (which is essentially a pajama pant). I was looking for my “size” on the envelope and I saw hip measurements, but no waist measurement. Us men buy our pants according to the numbers that correlate to our waist. And I don’t have hips: I’m average height and slim. So now what? The teacher was making her rounds helping us interpret our pattern envelopes and when she got to me she said “Stand up, let’s measure your hips.” I thought maybe she meant my waist. She took my tape measure and I stood up and pulled up my sweater up she could get to my waist. “Oh no, not there. Your hips are here,” she said as she wrapped the tape measure around my…hips…which turns out are located about four inches below my waist. Huh. Well, with the mystery of my hips solved I was ready to begin making my pjs. First, I cut out my pattern. Then, I lined it up relative to the grain line, pinned it in place and cut the fabric out following the pattern. Day two I learned how to use the zig zag stitch to finish the edges of the fabric. I also sewed the leg pieces closed and sewed them together. I took them home and tried them on so I could determined where the waist should be, and how long I wanted the legs, so that on day three I was ready to go. On day three I sewed the waistband and threaded in an elastic band and hemmed the pants to the proper length. And just like that I made a pair of pants! They’re very simple, and I won’t be wearing them outside of the house, but the idea that you can turn fabric into clothing that covers and protects the body is just amazing to me. And now I’m on to project number two! Inspiration to make this bag for my friend Charlene came from a trip to a city-wide art festival that we were planning. I knew we would be out and about all day and into the evening so I felt it had to be lightweight. And to give her easy access to her stuff—but not grant it to any one else—the crossbody style made the most sense. Starting with colors that I knew would be a hit with Charlene, I then measured out the fabric to be just big enough for a phone, wallet and a few necessities while running from exhibit to exhibit. The strap was made long enough to be worn easily crossbody without interfering with her hair (these things are important! ), but could also be shortened to function like a purse. Using Soft and Stable for interfacing also allowed me to work a bit of quilting into this project as well as providing some protection for her things. Rounded corners finished it off and we were all set! Almost 20 years ago, I tried turning some of my artwork into fabric with poor to mediocre results. There weren’t a lot of options to produce a small run of printed fabric, so my first attempt was with T-shirt transfer paper—it did not make for a cuddly pillow. A few years later, I hired a professional printer and silk screened my artwork. It was expensive, I could only use one color and was limited to an 8 inch square. Adequate for an experiment but not exactly the flexibility I wanted. Finally, technology has caught up with my desire to print on fabric with the arrival of Spoonflower. For this project, I used watercolor and india ink to create a 9″ x 12″ piece. I photographed it, touched it up in Photoshop and a few days later I had my 1 yard of cotton fabric and was ready to sew! I chose to quilt one complete section of the pattern by machine stitching on the black lines of the design. I added about an inch of white fabric for a border and with a few black outlines my pillow top was complete. I really like how the watercolor technique reads on the printed fabric and the quilting gives each color a three dimensional sea glass quality. I’m really excited to continue experimenting with this technique which allows me to combine painting, illustration and sewing!